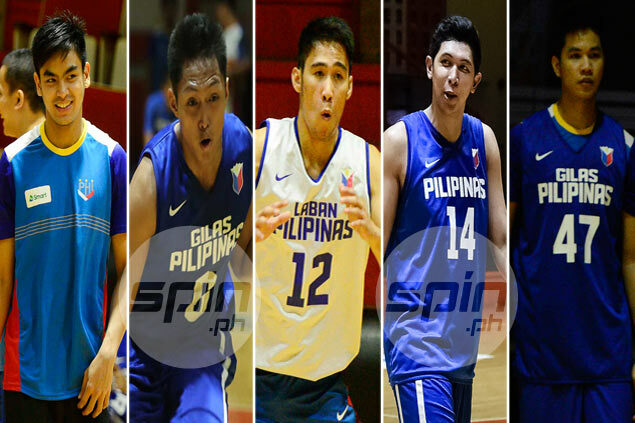 Gilas regulars Mac Belo, Mike Tolomia, Roger Pogoy and Kevin Ferrer are joined by new boy Jonathan Grey in the 14-man team to the Fiba Asia Challenge Cup in Iran next month. ARNOLD Van Opstal, Ed Daquioag and Jaymar Perez joined Gilas cadets regular in the 14-man lineup for the Fiba Asia Challenge Cup set next month in Iran. While national coach Josh Reyes went with old reliables like Mac Belo, Kevin Ferrer, Mike Tolomia, Russel Escoto and Roger Pogoy, the new-look Gilas lineup also featured a lot of new faces led by Van Opstal who at 6-9 stands as the tallest in this young team. Samahang Basketbol ng Pilipinas (SBP) executive director Sonny Barrios said all 14 players will make the trip to Iran for the September 9-18 showpiece, with two to be relegated to reserves. Former FEU big man Escoto and former Ateneo mainstay Alfonzo Gotladera are the other big men in this lineup which was left without top stars Kiefer Ravena, Rayray Parks and NCAA standout Jio Jajalon. Joining Belo in the power-forward position are his former Far Eastern University teammate Carl Bryan Cruz and University of the East center Chris Javier while Daquioag, Pogoy and Ferrer are joined by Jonathan Grey and Von Pessumal in the small forward/shooting guard position. With Ravena, Parks and Jalalon out, Perez, who has left Ateneo to join Lyceum in the NCAA, has been converted into a point guard to back up Tolomia and Blackwater reserve Arnold Vosotros. From the 14, sources said shoo-ins to the Final 12 are Belo, Ferrer, Tolomia, Daquioag, Escoto, Van Opstal, Gotladera, Javier and Pogoy.